Massey Ferguson is strengthening its position in the livestock and mixed farming tractor sectors with the addition of four, entirely new, 82hp to 107hp model tractors that join the MF 5400 Series. These tough, versatile workhorses are designed and built to handle the most challenging tasks. Tough and versatile workhorses designed to handle the most challenging tasks, these completely new tractors feature innovative new designs and have been created specifically to provide the power, performance and economy operators in this sector require. Not simply updates to existing models, General Marketing Manager, Shane Snijders, is excited by the combination of optimal power to weight ratios and excellent visibility and novel features that make these new MF 5400 series tractors ideal for loader-work. 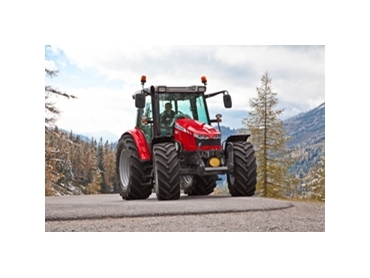 “For these four new MF 5400 Series tractors we have taken successful features, such as the Dyna-4 transmission and re-engineered them to suit precisely the specific customer requirements for this size and type of tractor. This means these new MF 5400 Series models offer the unbeatable combination of manoeuvrability, stability, visibility and access linked to lively, agile performance in the yard, on the road and in the field,” says Snijders. All of these new MF 5400 Series tractors are powered by the latest Perkins 4.4L, four cylinder 1104D-44T mechanical injection engines, which are renowned for their reliability and economy. The modern design allows maximum power at just 2,000rpm, reducing fuel consumption as well as cutting noise and wear. The engines also develop impressive torque figures at just 1,400rpm, meaning the tractors can operate at lower engine speeds to also cut fuel consumption and lower noise. The engines are encased in a sleek, new high visibility bonnet especially for these tractors, which provides a forward and side view and is shaped in such a way as to not compromise cooling efficiency. The one piece unit pivots open, providing excellent access for fuss-free servicing. Massey Ferguson has also invested into research and development of a completely new transaxle for exclusive use on these new 82hp to 107hp tractors. It starts with the highly efficient Dyna-4, 16F/16R transmission, which offers completely clutchless operation after starting up. This also comes with the renowned left-hand Power Control, clutchless reverse shuttle, ideal for loader work. Dyna-4 transmission has already gained a great reputation for reliability and efficiency, by combining a wide choice of speeds with low mechanical losses. For the new, lower hp MF 5400 Series tractors, the transmission has been made lighter and refined for use in these particular tractors. All models are standard with 540/540E/1,000rpm PTO, with engagement and speed selected electro-hydraulically with a button in the cab. Ground Speed PTO and super creeper are options. At the back of these new series tractors is a new rear axle, again designed specifically for these models. This offers a maximum lift capacity to 4,300kg, with a 10% lift speed increase, compared with current tractors. Standard, Electronic Linkage Control (ELC) provides straightforward, precise operation using Massey Ferguson’s well-proven system. A Dual Pump, open-centre hydraulic system provides plenty of flow, 42 L/min plus 57 L/min, at a pressure of 200 bar to handle all requirements of even the most demanding implements. To further improve performance with loaders is the unique, 100 L/min Twin Flow option, which combines the flow from both pumps. This output helps the MF 5400 Series tractors make light work of all materials handling tasks. Up front on these MF 5400 Series tractors is a new front axle casting, designed using expertise gained from larger Massey Ferguson tractors, provides a compact mounting for the new axle ensuring loaders are mounted easily and effectively become part of the tractor. Unique to this sector, this axle mounting provides enormous benefits for users. The integral design provides an exceptional turning angle, for optimal manoeuvrability and offers outstanding ground clearance. It also allows both the front linkage and loader to be fitted at the same time, which improves performance by reducing downtime. It simply makes it easier to use a loader and front linkage, further increasing the tractor’s versatility. Finally, operators will find the cab is a spacious, quiet workplace that benefits from a range of features found on the larger models, such as the cab suspension option. The sleek high visibility bonnet provides an optimal view to the loader and optional front linkage, which can be further enhanced by the Visio roof option. Standard cab specifications are very high, including vertical side exhaust, tinted glass with opening side and rear windows, heater, radio/CD player and air conditioning.